And Abbott’s staffers are pointing the finger at state budget writers, who allotted nearly $5o million less in general revenue for disaster relief than what Abbott’s office had asked for ahead of the 2015 legislative session. 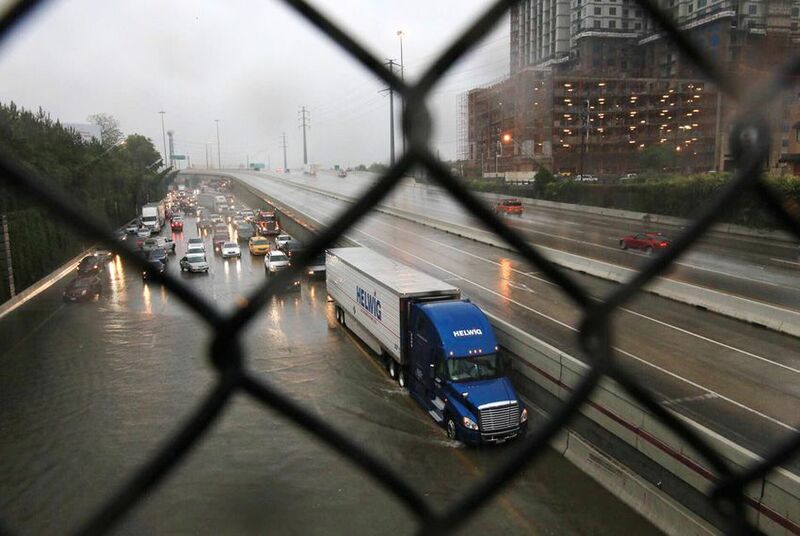 The issue came to light in a letter from Abbott’s office to Harris County lawmakers, dated June 30, when the governor denied their request for funds from the Disaster and Deficiency Grants program after severe flooding in that part of the state. The request from Harris County came as Texas had been battered with severe weather since last year. "Texas has withstood six presidentially-declared disasters in the past 13 months," Allen wrote. "These disasters have impacted nearly 60 percent of Texas’ counties and a population of over 19 million people." The state expenditures have been used primarily for search and rescue, swift water rescue, emergency medical, incident management and other law enforcement or emergency needs, John Wittman, a spokesman for Abbott, told the Tribune. The program’s budget includes money from general revenue funding and other sources, including grants, unspent balances from previous sessions and money from the state’s savings account, known as the Rainy Day Fund. When all of those sources are taken into account for the current biennium’s funding, the program actually received a slight increase from the previous session. According to the Legislative Budget Board, the total budget was about $89 million, compared with $83.3 million the previous biennium. Where the fund took the biggest hit — and what Allen makes note of in his letter — is the reduction in general revenue funding, which fell from $63.3 million in the previous biennium to $14.8 million in the current budget cycle. That total comes after $10 million of the fund was used for body cameras for law enforcement, as required by Senate Bill 158. While the general revenue funding appears low, it’s normal, according to the Legislative Budget Board. Agency spokesman R.J. DeSilva said the general revenue amount reflects the average annual amount in grants awarded over a prior six-year period, after the $10 million deduction. Asked about the funding amount, a spokesman for House Speaker Joe Straus noted that the amount was on par with previous funding levels and that the governor has the discretion to use the funds as he chooses. Lt. Gov. Dan Patrick's office declined to comment on the issue. As of June 30, there was about $46.1 million left in the state fund, according to Wittman. But the remaining balance might already be spoken for. “Based on our current projections of outstanding costs associated with disasters that have already occurred — which include estimating historical FEMA reimbursement amounts and timelines — the remaining funds may already be oversubscribed without supplemental assistance,” Wittman said. In its letter to Abbott, the bipartisan group of Harris County lawmakers did not request a specific amount, but the letter said the money would help reimburse local agencies who would be ineligible for Federal Emergency Management Agency assistance. In their plea, the lawmakers applauded Abbott for declaring a state of emergency and making Texas eligible for federal assistance. But they said that effort would only go so far. “Many affected individuals or entities like emergency service districts that provided services like transportation or post-storm debris removal may not be able to access this federal aid due to the varied and specific requirements for the various programs for addressing different types of disaster-related need,” they wrote. State Rep. Ana Hernandez, D-Houston, said that some of those families could include undocumented immigrants who don’t qualify for federal aid because of their status. According to the FEMA website, a qualified immigrant must be in the county legally, though undocumented parents can apply for aid on behalf of their U.S. citizen children or be eligible for short-term aid that doesn’t include a cash award, like legal services. Lawmakers still have options to add more money to the fund even with the Legislature not in session, including asking the Legislative Budget Board to move money between agencies. Allen said another significant event could deplete the fund. "Unfortunately, the funds remaining in the Disaster and Deficiency Grants program may not be sufficient for additional emergency operations that may be necessary to respond to future disasters during the remainder of the current biennium," he wrote. "Even under the most optimistic of FEMA reimbursement scenarios, the fund balance is a fraction of what would be needed for critical emergency response efforts for a minor hurricane or significant flood event." Asked if the governor’s office plans to seek more money next session, Wittman said Abbott is in discussions with legislative leaders about disaster funds. “The Governor has visited with the Speaker and Lt. Governor about the Disaster Fund situation and will work with leadership to ensure the State has the necessary resources in the Fund to be prepared for any disaster that may come our way,” he said. Hernandez said it might not be a bad idea for lawmakers to look at other line items and see where money should be reallocated when lawmakers gavel back in in January. “As the governor’s office prioritized border security, I think that it’s also important that we have funds available to our first-aid responders when natural disasters strike,” she said, referring to the record $800 million lawmakers approved for more staff and equipment on the border. “We definitely need to look at the metrics and whether it’s a prudent investment of state resources."